Wildlife: Bladderpod is used by upland game and songbirds, including quail for cover and forage (seeds) (CDFA,1976). Flowers bloom for much of the year and are visited by native and introduced bees, making this a good pollinator and hedgerow plant. Bladderpod is member of the Cappara ceae (Caper Family) and native to California (FNA, 2011; Hickman, 1993). It is a spherical shaped evergreen shrub 2-7 feet tall. The stems are profusely branched with corky bark on primary branches and smooth twigs. The alternate leaf is compound with petioles supporting three leaflets. The flowers are perfect, with green sepals half the length of the inflorescence, yellow petals and six stamens. The fruits are inflated capsules containing 5–25 seeds, which are are obovoid, dark brown and smooth. The three subspecies are differentiated by the shape of the capsules. P. arborea var angustata capsules are narrowly fusiform. P. arborea var arborea has inflated capsules that are obovoid, while P. arborea var globosa has subglobose strongly inflated capsules (Itis & Cochrane, 2007). 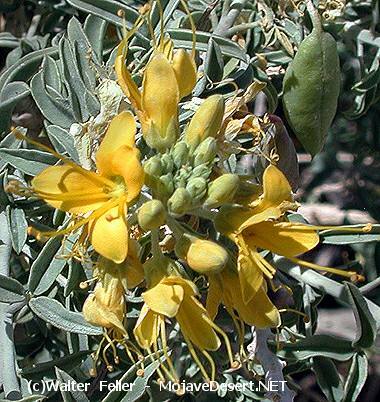 Distribution : Bladderpod’s native range is southern California, Baja California, and Arizona from 200 to 4,000 feet inelevation. In California, it is found as far north as Fresno and Monterey counties. In the Bakersfield and Tehachapi regions, it can be found to an elevation of 4,000 feet. P. arborea var angustata has a more southerly distribution, as far north as Kern and San Bernadino counties. P. arborea var arborea is reported as far north as Fresno and Inyo counties. Habitat: Bladderpod often grows on coastal bluffs, hilly terrain, desert washes, and disturbed areas. Bladderpod is drought tolerant, well adapted to desert conditions and alkaline soils. It has a wide range of temperature tolerance from below freezing to over 100 degrees F. In cultivated plantings, P. arborea var arborea has been grown as far north as southern Butte County. There are no known disease problems with bladderpod. This shrub must have good weed during early establishment. There are no known environmental concerns with bladderpod. Seed may be collected from wild plants and propagation plantings by stripping pods from plants and extracting seed. Seed should be cleaned using an air-screen cleaner with a No. 14 screen on top and No.8 bottom screen. There are approximately 4,500 seeds per pound. Plants are usually propagated by direct seeding into containers in a greenhouse. The seedlings develop at a rapid rate and should be moved into larger containers as they develop. Seedling plugs or one gallon container stock can be transplanted to the field at a 4-6 ft spacing in either the spring or fall. Irrigation may be required at transplanting, but once the plants are established for 1 or 2 years irrigation is no longer required. Cultivars, Improved, and Selected Materials (and area of origin) ‘Dorado’(Peritoma arborea var. arborea) is a cultivar developed by Lockeford Plant Materials Center, Lockeford, CA. The plant material used to develop ‘Dorado’ was first collected in August 1966 near Gorman, CA at an elevation of 3800 feet. ‘Dorado’ grows best in soils with well-drained deep to moderately deep, medium to finely textured soils with a pH of 6.5 or higher. ‘Dorado’ is drought-tolerant and is able to survive extreme temperatures ranging from below freezing to over 100 F. Although it is best adapted to Southern California, ‘Dorado’ has been successful established in the Sacramento valley. ‘Dorado’ has shown excellent performance as a conservation plant on critical areas, upland game cover and food, and for environmental enhancement. ... it isn't likely to survive to maturity. Three plants that seem to bloom even in poor years are the Bladderpod, Creosote Bush and the Jimson Weed or Datura.